ROLLING ON THE FLOOR LAUGHING -- John you made my day. That's what I'm here for. Thanks for the kind word. 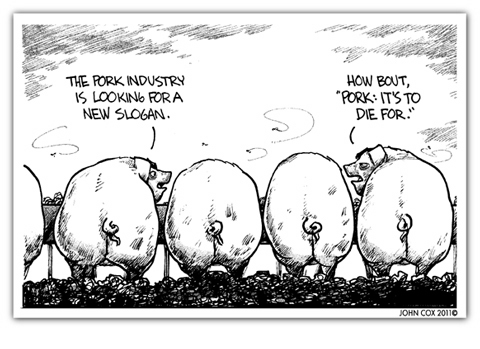 "Pork: greasing the wheels of politics since 1776!" "Pork: because you're young and healthy, and your heart can take it!" "Pork... for just 87¢ a day, you can help send trucks full of pork to the planned site for the Cordoba House in New York City, where they will be dumped on the sidewalk in front of the proposed building site. To be assured that your money is going to a good cause, we'll send you a picture of a bat-s__t crazy Islamofascist blowing out a major artery in extreme frenetic rage as he burns an American flag and screams how you, the infidel, must die. Please... Will you let another day pass with one of these crackpots not having a lame excuse to justify his irrational hatred? Will you be the one responsible for crushing little Mustapha's warped world view?" Screw it! I've got maybe 10-12 years left, and I'm having BACON and eggs! Nothing better than a ground pork burger at the Goodhue County Pork Producers stand at the county fair! "Pork - there's nothing better!" "Pork: Enjoy life. If you live too long, the 'progressives' are just going to put you in front of a death panel anyway." "Homer: Lisa, honey, are saying you're never going to eat any animal again? What about bacon? Lisa Simpson: Dad! Those all come from the same animal! Homer Simpson: Yeah, right Lisa. A wonderful, magical animal." Now get out there and butter your bacon! As I sit here, my wife has started cooking a pork roast for dinner today. The side dish will be mashed potatoes and gravy. Yeah, I'm healthy. This page contains a single entry from the blog posted on March 5, 2011 5:14 PM.